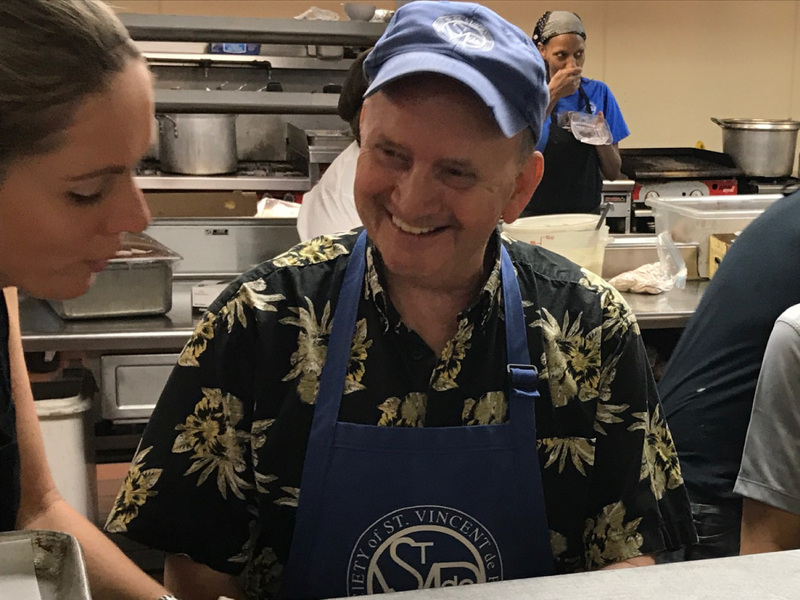 Tom Buzzo has been volunteering in the kitchen at St. Vincent de Paul since 2010. Mention his name to those on the grounds of the shelter however, and you will likely get a blank stare. Disciplined, unassuming, soft-spoken, and quick to credit others, Buzzo is also known for something else: a work ethic with roots that can be attributed as much to his Northern Michigan upbringing as his 32 years in the United States Air Force. 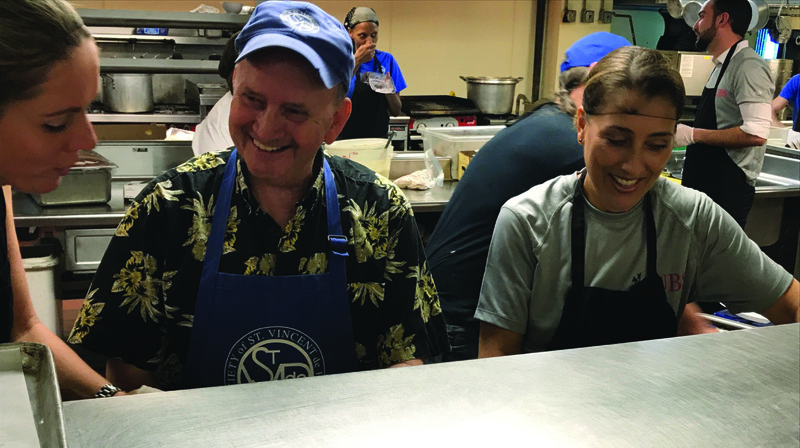 Every Monday and Tuesday the 68-year-old dedicates his time to Meals on Wheels in St. Petersburg and Thursdays and Fridays he’s serving at St. Vincent de Paul. For three hours each day, he prepares the kitchen, the food and helps serve an average of 250 meals. He also works in the shelter’s pantry where 200 food baskets are distributed to the working homeless each week. Tucked under the interstate in downtown St. Pete, St. Vincent de Paul has served its target population – the hungry, homeless and impoverished people for over 55 years, assisting those in dire circumstances through well-managed, highly effective, quality programs that address their most basic human needs. “Not everybody realizes it, but we get more snow there than Buffalo. We’re actually north of Toronto,” says Buzzo not without pride. Life is not easy there. There are few desk jobs. Buzzo’s father worked in the copper mines for $75 a week. His siblings remain in Lake Linden and he would have likely done the same, if not for one thing. “I had a skin condition growing up. My skin would crack and bleed in the cold weather, then it would clear up in the spring,” says Buzzo. He was drafted by the Army at the age of 18, but was classified as 4F due to his ailment. His doctor’s diagnosis was easy: warm weather year around. And so, in 1969 at the age of 20, Buzzo headed south to Tampa Bay. It worked. The rash left, Tom stayed and a life of selfless service began. While working a series of odd jobs, he met his wife, the former Deborah Sternberg, and a family of five ensued. Rash-free and eight years after he landed in the Sunshine state, Tom decided to enlist in the Air Force. A tech sergeant, Buzzo did tours at bases in Homestead, Florida, Charleston, South Carolina and handled temporary duty in Germany before applying for and receiving an assignment closer to home for CENTCOM at MacDill Air Force Base in Tampa. “It was only supposed to be for two years, but then, 911 hit and I ended up staying for six more until I retired,” said Buzzo. Through it all, for more than three decades of military life, he never missed a day, was never late, never written up for anything. The same can be said for his time with St. Vincent de Paul, which began on a limited basis in 1992. Buzzo credits the clergy at St. Petersburg’s Sacred Heart Church for his three-decade involvement with St. Vincent de Paul. Or a hand that once was home to a fortuitous rash. Click here to download this story as a .pdf document.